San Diego Opera opened its 2013 season Saturday evening with Gaetano Donizetti’s La fille du régiment, titled here in English as The Daughter of the Regiment, but sung (and spoken) in French by an international cast under the musical direction of the extremely capable conductor Yves Abel and the imaginative if hyperactive stage direction of Emilo Sagi. The production, updated to represent a French town full of American soldiers during WWII, comes to us from the Teatro Comunale de Bologna. With sets and costumes by the late Mexican designer Julio Galán, this production can be seen on a commercially available DVD, also directed by Sagi and featuring singers Patrizia Ciofi and Juan Diego Florez as the romantic leads. 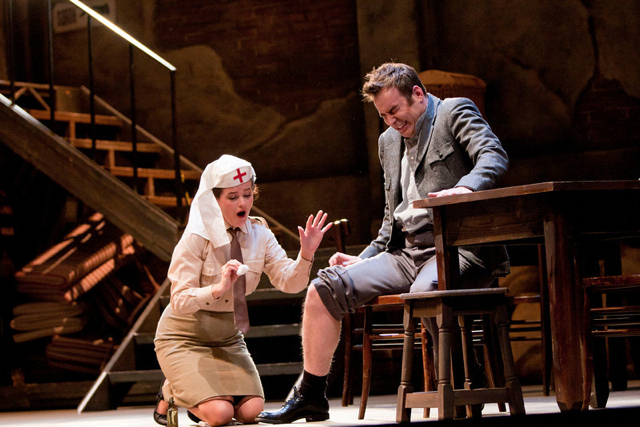 Those two roles were assumed in San Diego by Slovakian Soprano L’ubica Vargicová and American tenor Stephen Costello. The opera, over-hyped as a tenor vehicle on account of its nine high Cs — the equivalent of a quadruple axel in Olympic figure skating and hence regarded with something of the same one-to-10 scoring system in everyone’s minds — contains much very beautiful lyrical music. Donizetti was a wonder with melody; one often feels he could have used some of his meltingly lovely tunes in his tragic operas instead of wasting them on frivolous comedies like La fille du régiment. I confess to a deep fondness for this composer. Because they have distressingly become the opera’s main selling point, let’s dispense with the damned high Cs straight off. A man seated near me rapturously counted them out loud to his wife (whilst a gentleman behind me cheerfully rustled what I can only assume were the wrappings of a large ham sandwich). I give Costello about an 8.5, but only because Pavarotti was a 10 who made you think nothing in the world could equal it, and I give Juan Diego Florez a 10 as well, although his voice is smaller and of a very different quality. Costello, who seemed freer and more comfortable on the stage than I have ever seen him before, still does not seem as relaxed, confident or as joyous as the other two gentlemen. Frankly, I was more interested in the rest of Costello’s singing, much of which was lovely and extremely affecting. In the opera’s story, these high Cs are ignited by young Tonio’s love object, the beauteous Marie, the daughter of — in this case — an American regiment stationed in France who have adopted her as a sort of mascot. I don’t know if such an adoption is possible in the American military, but it seems to me it is exactly the sort of crazy thing an American regiment might actually want to do. At any rate, they are all her “fathers” and protectors. However, Marie is in fact the love child of the Marquise of Birkenfield (the great Polish contralto Ewa Podleś) who reclaims her just as Tonio joins the regiment to be near his beloved. Most distressing. But not to worry: all ends well. Podleś, memorable as a superlative Erda in Wagner’s “Ring,” shows an unexpectedly comic side as the Marquise, and yet she is so outrageously campy from the get-go that her calmer moments in the second act seem out of character. Nonetheless, she truly steals the show — but not without some competition. The comedic dress extras’ antics in Act Two as window washers and whatnot were the true scene stealers of the evening, upstaging everything else going on and totally distracting from the singers. I would be “projecting” if I said such egregious reaching for easy laughs comes from director Sagi’s dislike of the opera. I did a similar thing to The Pirates of Penzance when I directed it in college; I disliked the piece then (but not now), so I added endless silly schtick to direct attention from G&S to myself and my own cleverness. A sign of disrespect and immaturity. Soprano L’ubica Vargicová has appeared here before and is an attractive talent, gifted with a voice that has a full character to it that does not fit Marie ideally. To my ear she was below pitch on almost all of her top notes all evening, and yet she she was largely quite beguiling. I felt basso Kevin Burdette delightfully embodied the character of platoon leader Sergeant Sulpice, and he effectively complemented the trio (“Tous les trois réunis”) while ludicrous antics upstage were trying to draw our attention from it. They should sue. Soprano Carol Vaness had a cameo appearance in the speaking role of the Duchess of Krakenthorp, but going so far as to sing as few bars of “Mon coeur s’ouvre à ta voix” from Samson and Delilah, a sort of comic advert for the SDO’s next presentation. Amusingly fake San Diego dignitaries showed up for the party. One wonders what real Frenchmen and women would have made of the accents in the spoken passages. The chorus continues to do superb work and should never go without recognition — and the orchestra with Abel at the helm was excellent as usual. Judging from the matinee of SDO’s “Daughter of the Regiment,” and a good pair of binoculars, SDO should have billed this production as “The Daughter of the Well-fed Geriatric Regiment.” At least eight male chorus members looked quite gray-haired and nearly a dozen distinctly over weight; okay, fat! And they were supposed to be a U.S. Army contingent? Obviously, desk jobbers, not infantrymen, who have to march a lot and burn calories as part of their military jobs. As for soloists, alas, Sills and Sutherland are gone and so is real bel canto singing. And the WWII era setting? Kind of worked, but a bit too colorless in the first act. Best thing about it all? Yves Abel’s superb and in-control conducting. Worst thing? The silly SuperTitles and not allowing the Duchess of Krakenthorp to utter her “Scandal!” and storm out of the Marquise de Bikenfeld’s home at the end of the opera. I’m sure F. Bayard and J.H. Vernoy de Saint-Georges, who wrote the libretto, turned in their graves. No wonder composer Gaetano Donizetti went insane. Regiment as a Classic Ballet piece. Watch for this musically lovable Ballet in the next two years. No first soloist or Prima has been as yet chosen for Maria.I am waiting on tenter hooks,but I am positive Gaetano will roll over and sleep peacefuly. A.M.